Alfie is a fun-loving young lad who loves to bury his toys and chew on plastic bottles! He doesn't really enjoy kennel life but because he builds such strong bonds with people, staff are able to help him to deal with his current environment. He loves to go for long walks with them, making friends along the way, and joining them for a sniff. 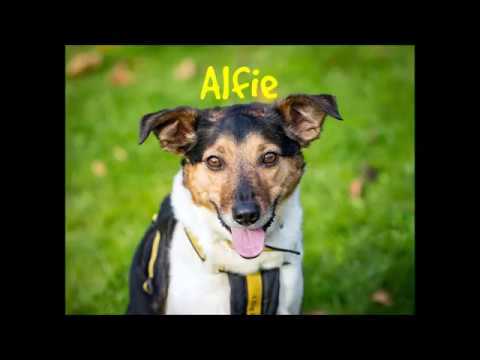 Alfie gets along with dogs outside the house but in the home, he tends to be a little possessive over toys and treats so will need to be the only dog in the home. Alfie is housetrained and is ok to be left for a couple of hours. Because he builds such strong bonds with people, and has a tendency to want to protect things he feels are important, Alfie will need a SINGLE PERSON household to live in. He's very affectionate and soppy but he isn't keen on sharing the affection around. He is perfectly housetrained. Thank you for your interest in Alfie, who is based at Merseyside. Please note this is not a reservation on this dog. To start the rehoming process you will need to go to a rehoming centre for a quick chat. Please find information below about what to expect during the rehoming process. We hope to see you soon.